Our plastic sleds and backpacks were loaded for what seemed to be a three-week trip rather than the actual three-day trip we had planned. Bungee cords held duffle bags and coolers in place as six friends and I prepared for snowshoeing. We pulled the sleds a little over a mile on the trail to a quaint rustic cabin nestled securely among tall trees and about 35 yards from the icy shoreline of Lake Superior. Gentle rolling waves pushed up against piles of blue-green ice shelves separating the land from the sea. The view at first glance was breathtaking. A rustic cabin by definition meant that there was no running water, no electricity and no indoor plumbing. Inside there were merely four sets of bunk beds, cabinets with a few pots and pans, and a wood burning stove. That was it. Outside was a pile of fire wood and an outhouse. Although the landscape was snow-covered and making the area a winter wonderland, a stream flowed swiftly not far from the cabin, providing drinking water to be collected and filtered when needed. We unloaded the sleds, organized the kitchen area, claimed our bunk and unpacked our remaining gear. Since it was late in the afternoon, we lit a fire in the stove, fired up two Coleman lanterns and prepared supper. The remainder of the evening included card games, socializing and planning for our snowshoe adventure the next day. A snowshoeing and rustic cabin adventure can be an enjoyable experience for those who have never tried it. 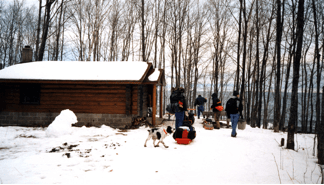 It involves snowshoeing to and from one of a few rustic cabins located in an Upper Michigan state park or national forest. Once settled into your cabin, you then explore your surrounding woodlands on snowshoes during your stay… day or night. The Porcupine Mountain Wilderness State Park has 19 cabins and four yurts to rent throughout 60,000 acres of a mixed deciduous and coniferous forest including stands of virgin pine. However, only three rustic cabins are available to rent in winter. Each cabin has a name. Gitche Gumee is situated in a scenic wooded spot about 200 yards off Highway M-107 near the east entrance to the park. Whitetail is located about a mile hike off M-107 and offers that grand view of Lake Superior. The third dwelling is Union River cabin nestled in the woods where the Union River flows by just yards away. I’ve stayed at Union River cabin on three occasions, backpacking three miles on snow-covered trails to get there. There are no water pumps available at any of the rustic cabins. Each unit sleeps up to eight people and costs $60 a night. And all four yurts are open in winter as well. Fondly referred to as The Porkies, the park is home to snowshoeing, cross-country, alpine skiing and snowboarding, making this area quite an active winter recreation location in the northern most part of the Upper Peninsula of Michigan. 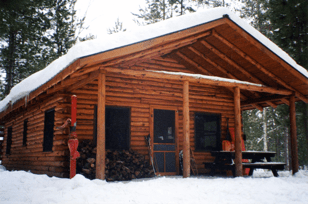 Upper Peninsula’s Hiawatha National Forest, located nearly 200 miles east of the Porkies has two year-round rustic cabins in their west unit. 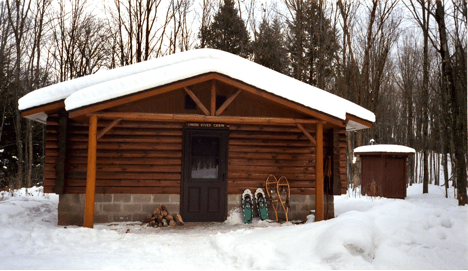 McKeever Cabin is in the Munising Ranger District sitting 14 miles south of Munising, Michigan and two miles east off of Federal Forest Highway 13. The cabin is in a wilderness area overlooking the 132-acre scenic McKeever Lake. 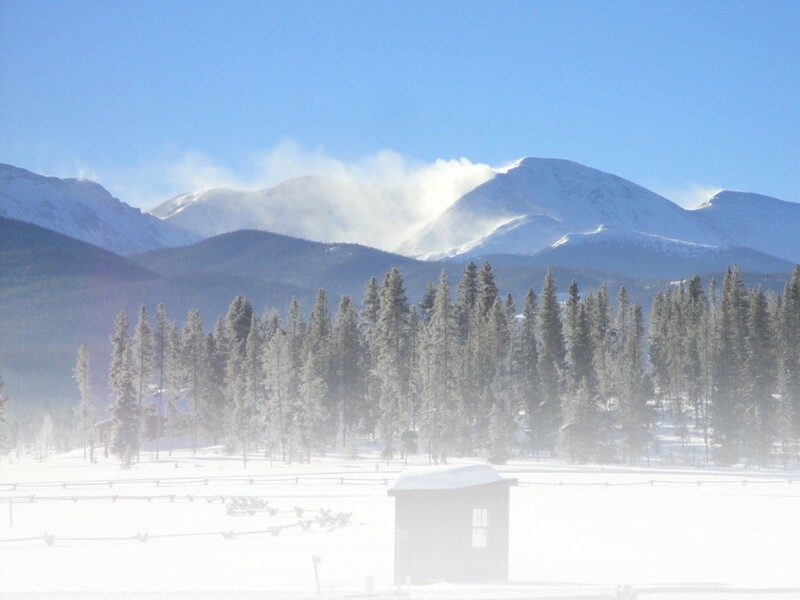 From the parking area, winter visitors have little over a mile hike to reach the cabin. This unit sleeps up to six people. A wood stove is available as well as an outhouse and an outdoor water pump. Rent for this cabin is $45 a night. And close to McKeever Cabin is Bruno’s Run, a trail designated for snowshoeing. This 7.25-mile looped trail winds through a pristine winter forest made up of hills, valleys, overlooks and a few small lakes. Tom’s Lake cabin is the other Hiawatha rustic dwelling in the Rapid River/Manistique Ranger District, located about 29 miles northwest of Manistique, Michigan. It too can be found east off FF Highway 13. This picturesque cabin sits on a hill surrounded by tall pine trees and overlooks the 23-acre Tom’s Lake. The cabin has two rooms and accommodates up to eight people. A water pump is located just a few yards outside the cabin door and the outhouse is in the back yard. The hike to the cabin is about a quarter-mile from a plowed parking area. Cost for a night is also $45. At Tom’s Lake, two friends and I hiked in and out on snowshoes pulling plastic sleds with gear needed for five days. The surrounding woodlands offered us unlimited opportunity for snowshoeing. We snowshoed on many trails leading to neighboring lakes both during the day and at night. On one occasion, the three of us used a map and compass as we broke trail for a mile to a wilderness lake that had no road or trail access. The Upper Michigan rustic cabins have little to no kitchen supplies. So, we took pots, pans, utensils, gas cooking stove, matches, fire starter, and food and drinks in a cooler. We also packed in sleeping bags, gas lanterns, and extra winter clothing including an extra pair of boots. We did bring a sleeping pad, although the cabins had three-inch thick sleeping pads on the bunks. Be sure to carry a water purifier. The Porcupine Mountains cabins do not have water pumps and require carrying in water or filtering from a nearby stream or river. I also packed in toilet paper. There may or may not be some in the outhouses….so be prepared. And most importantly, we brought our snowshoes and hiking poles. 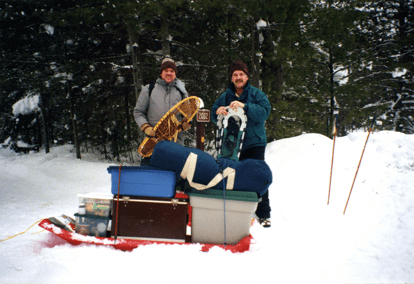 These two snowshoers are more than well packed for Tom’s Lake Cabin in the U.P. 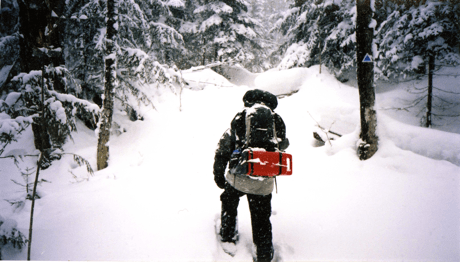 I also recommend bringing a daypack with safety items to take on snowshoe hikes, such as a first aid kit, map and compass, headlamp, pocket knife, whistle, compact space/thermal blanket, rope, candle and matches, sunglasses and sunscreen, handheld ice spikes (for crossing frozen water) and a snowshoe repair kit. Remember to fill your water bottles before leaving, but fill about an inch or so from the top to allow the water to move and keep from freezing. And be sure to bring a camera, because no one would believe how beautiful the northwoods can be in winter. It just does not get any better than snowshoeing from out a cabin door in the backwoods of the Upper Peninsula of Michigan. There are miles and miles of snow-covered trails you can venture on in these state and national public lands. There are also endless opportunities for going off trail in search of a destination found on a map. Following a hearty lunch of cheese, sausage and crackers, six of my friends and I stepped outside our rustic cabin just yards away from the icy shore of Lake Superior. We got ready for an all day snowshoe hike. With our daypacks and snowshoes, we hiked about two miles on a southwesterly trail into the Porkies. We reached a trailhead that leads up to the four-mile long Escarpment Trail that runs parallel to the lake and high above the trees. Author Jim DuFresne, who wrote a book about the park, stated that the Escarpment Trail is “the crowning jewel of trails, not only in the Porkies but in all of Michigan and possibly the Midwest.” Our small group ascended up onto the Escarpment that leads to the highest point at 1,600 feet above sea level. Keep in mind that the “mountains” of Upper Michigan are merely hills in comparison to the mountains in the West and East. But they do offer spectacular views. From high up on the Escarpment we were overlooking Lake of the Clouds some 400 feet below. This extraordinary 300-acre scenic lake has been very popular for photographers in all seasons, and is known as an enchanting mile-long lake nestled in this old growth forest of virgin pine and hemlock. The landscape and lake at this point in time was draped in elegant white for as far as we could see. Once we snowshoed back to the cabin, we retreated for supper, a card game and a long winter’s nap. At the end of our trip, we cleaned up the cabin before leaving, cleaned out the stove and restacked wood for the next visitors.